MassiveBooks provides book related features such as better displaynames, copying books, unlocking locked books for more editing, powertools, unique serverbooks, and ingame libraries using item frames. 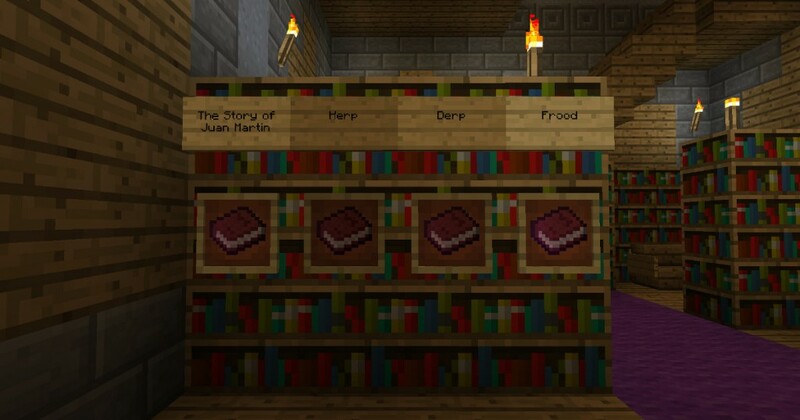 Did you know that using colors in books is a standard Minecraft feature? No plugin is required to do that. Read all about colors in books on the official Minecraft wiki. The commands operate on the book you are holding in your hand at the moment. Unlock a book that has been locked/signed. This will allow you to edit the content again. Lock a book and keep the previous title and author. This command is usually used on “unlocked” books to avoid having to retype the book title. Clearing a book will turn it into a normal book and quill. The title, author and content will be completely removed. Set a new title for the book. You can use color codes in the title if you want to. Creates copies of the book. You must however have the resources unless you are in creative-mode. Lists all serverbooks. These books can be loaded by using the load command. Load a serverbook. If the book in your hand has content it will be overwritten. Toggle the copyrighted state for the book. Books that are copyrighted can only be copied by the author and not by others. The copyrighted state will only be modified for the book in your hand. Already existing copies of the book will not be affected (unless it’s a serverbook). Show plugin version and information. Set a new author for the book. This command is used to give serverbooks to players without resource costs. An integer/number amount can be specified. If you write “ensure” or simply “e” instead of an integer/number amount the player will only be given the book if they don’t have it. If you write “all” instead of a book title the command will hand out all saved serverbooks. If you don’t specify any title an empty bookandquill will be used. Save the book as a serverbook. The title of the book works as the id. Delete the server book with the title specified. Toggle your personal autoupdate setting. Autoupdate is good and should be set to true. However you must disable it when modifying server books. Otherwise your changes will be autooverwritten before you get the time to save them. Toggle the powertool state for the book. Powertools are books where the content is commands to run and messages to say. Hit and interact with the book to execute it as a powertool. The displayname of an item can be set using an anvil. It can also be set by plugins and we make heavy use of that advantage in MassiveBooks. We insert the author displayname into the book title. The better displaynames are really helpful for unlocked books. Without MassiveBooks you would not be able to see the current title and author at all. There would be no way of telling whether this book and quill contained any info or not. Powertools get a purple prefix just like unlocked books. This will make it easier for you to separate powertools from normal books. Serverbooks are handled using the commands list, load, save and delete. Normal players can only list and load. The moderators/administrators use the save and delete command to maintain the server books. When a serverbook is created the title of that book is reserved and registered. All other books with the same title will be updated to have the serverbook content. Say you save your book “Rules” as a server book. If you were to change the content of the rules-book by unlocking it, altering it, and saving it again, then all existing old version your players possess will be updated automatically. Neat huh? Remember to use “/book autoupdate off” when editing an existing serverbook. Otherwise you will have great troubles changing the content since your changes will be overwritten with the old/current values by the auto update system. Item Frames can be used to create ingame libraries. Just put a book in an item frame. If you hold a book and quill and click the item frame you will load the book inside it. If you click again you will unload the book resulting in an empty book and quill again. Tip: Any book can be cleared using the command “/book clear”. Tip: You can place unlocked books in item frames as well. A powertool is a special kind of book. You can turn any book into a powertool using the “/book powertool” command. When you click with the book you will say the lines in the book. If the line starts with a slash (/) you will run a command. Lines starting with “#” will be ignored.